Very quietly and without fanfare, Japan has strengthened its military forces to the point that it now becomes “the fourth most powerful military” force in the world (first link). It is also embarking on weapons-procurement programs that will make its military forces much more powerful. It is not surprising that Japan would build a large armed force given its geographical position in the world. It is located near China and off the east coast of Russia, two of the superpower military nations on the earth. Those two nations, along with the USA, surely constitute the top three conventional military powers in the world today. Given the rapid militarization of China, Japan has no choice but to beef up its military forces if it wishes to stay an independent nation. The first link has several items very worthy of mention. It stated that Japan’s defense budget for 2019 is $900 billion. If that figure is correct, that it a sum larger than the proposed new US military budget for 2019 (which is circa $750 billion)! That means that Japan would likely have the largest reported defense budget of any nation on earth in the next year. Keep in mind that when I write “reported” military budget, I regard Russia’s and China’s military budgets as being substantially understated. Another reason why Russia’s and China’s military budgets sound artificially low is that these autocratic nations don’t need to worry about “paying union wages” on their defense contractors. Where is Japan’s emphasis in their military build-up plans? The first link reports that some areas include purchasing mid-and long-range cruise missiles, supersonic glide bombs, hypersonic missiles which can travel at least Mach 5, new American-made F-35Bs which are naval variants of the F-35 airframe, etc. Japan is also purchasing new Joint Strike Missiles for the F-35s it is ordering for its military forces (more on that shortly). The size of Japan’s new military budget allows for massive increases in military power in all types of weapons, but let’s examine just a few of them in greater detail. It is clear that Japan is building or buying cruise missiles that can penetrate deep into China in the event of a war. Guess which nation is selling to Japan its new Joint Strike Missiles? The second link and third link reveal it is NATO-member, Norway, which is building these new missiles for Japan. These missiles are very important to all nations that will use the new F-35 warplane as this new long-range missile will fit inside the fuselage of the F-35 so its stealth capabilities are not compromised. These links do not mention a range for these new missiles, but I found a link which did offer that information. The fourth link states that this Norwegian-built missile has a range of 550 km and that Japan is building domestically-made cruise missiles that will travel an unspecified distance further than 400 km. 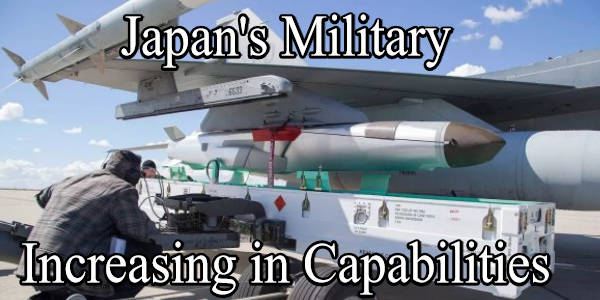 The fourth link also has interesting related links about Japanese military programs and priorities. It is also worth mentioning that, nations rarely ever give the true extent of their new weapon’s capabilities. This means that these new cruise missiles being bought from Norway by Japan may actually have a significantly longer actual range than the stated range. Japan could not buy cruise missiles of that range from the USA yet because the USA is bound by an arms treaty with the former USSR that limits medium-range missiles with certain ranges. President Trump has served notice that the USA is voiding that treaty, and one reason is that China and Iran are not bound by those limitations. I’m so glad the modern Norwegians, the modern descendants of the ancient Vikings, stepped forth to build those medium range cruise missiles for Japan. As soon as the treaty expiration period is reached for these missiles and the USA is not bound by any range limits for cruise missiles, I expect the USA will also make such missiles or simply co-produce the missile now being built by the Norwegians. The fifth link reports that Japan is going to do something that I wrote in previous posts would almost surely be done. Japan is buying F-35B warplanes from the USA to equip their “flat-top destroyers” (i.e. helicopter carriers) to handle and serve F-35B warplanes. In other words, Japan will be converting their helicopter carriers to aircraft carriers when this plan is implemented. I believe that Japan has two such carriers at present so they will possess two aircraft carriers as soon as this action is taken. Even if Japan is the fourth largest military force in terms of conventional weapons, Japan has no nuclear weapons at present. Its Constitution does not allow it to have nuclear weaponry, but as China’s militarism continues, it is likely only a matter of time until Japan is forced by circumstances to “go nuclear.” It has long had enough civilian nuclear reactors to produce weapons-grade fissile materials, and it clearly has the technology to build nuclear weaponry of all types. As Wikipedia observes in the sixth link, it has been observed that Japan may already only be “a screwdriver’s turn” away from having a stockpile of nuclear weapons. This euphemism means that Japan could have already built the components for workable nuclear weapons, but it can plausibly deny it has nuclear weapons because it hasn’t actually assembled the components together yet. Given the need for deterrence, Japan may at some future point announce it is a nuclear power in order to deter China and Russia from attacking it. If the USA ever has the misfortune to elect a socialist/leftist president, Japan’s need to go nuclear will be greatly accelerated. Concerning other nuclear powers in the world, the United Kingdom and France are NATO allies of the USA that have nuclear weapons. Israel is widely assumed to have nuclear weapons and they are a US ally. Pakistan is an ally of China so its nukes are allied to China’s nukes. India, threatened by both China and Pakistan, is also a nuclear power and it is drawing steadily closer to the USA and other western nations. It’s amazing how a few decades can see dramatic changes in national alliances. In World War II, the USA was allied to China and Russia vs. Japan and Germany. Today, the USA is allied to Japan and Germany against Russia and China. Japan has emerged as a particularly stalwart ally of the USA. I believe that Japan’s role as an ally of the USA and the Western nations was prophesied in the Bible in the latter-day prophecy found in Ezekiel 38-39. If you would like to see the reasons why this assertion can be made, please read my free articles, Japan’s Role in Prophecy, What Ezekiel 38-39 Reveal about a Future World War III, and (to firmly document that we are living in the “latter day” time frame given for Ezekiel 38-39), see also my article, Are We Living in the Biblical Latter Days?